One of the oldest towns of the middle Slovakia region. 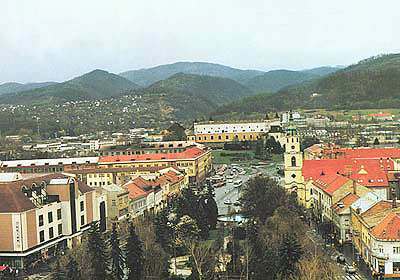 Zvolen is situated in the southwestern part of the basin of Zvolen by the confluence of rivers Slatina and Hron under the promontory of Javorina mountain range. The first written notice about the settlement comes from 1135 and is related to the locality of Pustý hrad ( a castle) where used to be the center of power administration. From the 14th century it served as a residence of county administrator of Zvolen who changed the estate for the Zvolen castle at the end of the 15th century. Penetration of the Turks to the surroundings of mining towns required improvement of castle fortification and building new forts. The Zvolen castle was fortified with a participation of Italian engineers at the end of the 16th century. At the same time there were made walls around the city. The Zvolen castle ( a national cultural monument) is a gothic building masterpiece. It was ordered to be built by the Hungarian king Ľudovít Veľký z Anjou (Ľudovít the Great from Anjou) as a gothic hunting residence in the 2nd half of the 14th century. The building was renewed by the later owner – Hungarian aristocrat Ján Thurzo at the turn of the 15th and 16th century. Being influenced by the Turkish raids it was rebuilt in renaissance style in the 16th century again. Today, its space is used by the Slovak national gallery and exhibits of the European medieval art and Slovak modern art. The Fairs of the Zvolen castle take place at the castle courtyard annually during the summer months. In July, Zvolen is a place of international folk festival of university groups called The Academic Zvolen. The gothic church of sv. Alžbeta attracts the attention of the visitors. It was built at the 2nd half of the 13th century. There are passage townhouses built in various styles in the historical square. The oldest monuments are remnants of the county castle in the locality of Pustý castle from the period of reign of Bela III. There is a monument of Janko Kráľ built by academic sculptor Ján Kulich in 1962 in the courtyard. The spa Sliač and a national airport have a first-rate significance for the district from the aspect of tourism. Circulation system defect are healed here. The mineral springs have a temperature of 13 ˚ C. The water is of a disulphate- hydrocarbonate, calcareous-magnesium character. The municipal transport to Zvolen is another advantage. Events of cultural summer of Sliač delights the patients and visitors during the summer months. Except the traffic artery of international importance situated southwards from the district town Zvolen attracts our attention mainly country sites which dispose with preserved objects of folk architecture – farm houses with wooden carved gates and occasionally people clad in folk costumes. If we continue southward along this route, ruins of the castle Dobrá Niva and a Romanesque catholic church built round year 1241 with a valuable interior grab our attention. Another possibility of cognition routes is a protected area – Arborétum – Borová hora (hill) and botanic garden, which are able to satisfy event the most exigent visitors of nature. There is a very interesting stroll along a newly created cognition-tourist path from ice-ring to the already mentioned Pustý hrad (castle). Are you interested in our town, do you want to know more, all, you are interested in and even more you will find on multimedia CD about town Zvolen.